Do you have any data about how many Firefox users actually use AddOns, as a percentage of the whole? How is the current window “unspoofable”? I’m not sure that this needs to be a primary concern at this time. Let’s focus on the main interactions for now, I think. Talking about ‘scanning an entire add-ons inventory’, how about allowing instant view of installed addons for a given category ? I mean, for instance, in your wireframe I can see a category named ‘Features’ in the left panel. As a user, I wish I saw a complete view of installed addons within the right panel when I clicked on the category’s name. Meaning thumbnail-style view. 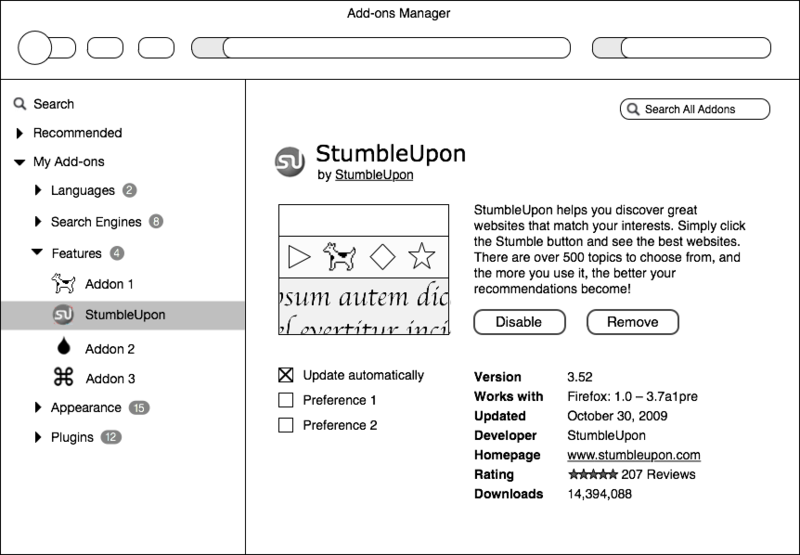 And clicking on the thumbnail for ‘StumbleUpon’ would bring the info depicted in your wireframe. Let’s say we could display max 16 thumbnails per page, which should be enough for the big majority of users, I guess (except for power users, I don’t think lots of people would have more than 16 add-ons for a given category, and even if it’s the case, you could probably give them the option to click on a ‘Next page’ link to show another page of addons). I propose this because i’m not a big fan of drop-down lists, they clutter space IMHO and sometimes force users to scroll down. Very nice! I really like the per Add-on automatic update!! Now if we can get all the separate windows to open in tabs then I’d be estatic! The design is very nice! * There are already some Add-ons that enable “showing as a tab” but don’t modify the layout otherwise. So it would be a good “feature” to be able to switch between window/dialog and tabbed mode -> maybe even do a test-pilot-survey about this. Thanks for work You’ve invested in this. Would it be possible to implement this as an Add-on for Testing it NOW without the need to install a nightly? this would enable the possibility to do Test-Pilot-Survey befor integrating it permantently. I think your mockup is way to complicated. I definitely like the idea of putting the manager in a tab, but you should not put more information there. Information like Compatibility, “updated” and so on should only be shown if the user explicitly clicks on it. I would suggest to show a list of all addons with activated/deactivated status by default like in the old dialog. Regarding making the Add-ons Manager (and other chrome dialogues) not spoofable, I have a few ideas. First, tabs that belong to the chrome could be differentiated from web tabs. This could be a different background, different font, different favicon (or none at all), or some other way of differentiating the appearance. If web tabs looked like Stephen Horlander’s ‘Page Integrated Tabs’ mock-up, differentiating between them and the chrome would be even easier, as chrome tabs would retain the look of the rest of the chrome. Secondly, the location bar could also be differentiated. The identity button could be made to look more chrome-like, or eliminated altogether. The URL could be replaced with a more readable breadcrumb trail (like Alex Faaborg’s ‘Personal URL’). Better yet, when Firefox 4 comes around, the whole Navigation toolbar could be eliminated altogether—a behaviour reserved for the browser and applications that are given permission. Finally, whatever behaviour you choose in the end for the Add-ons Manager, I hope it will be made consistent with any other chrome dialogues that will be moved into tabs in the future (and the special Home tab). I have to say, I have reservations about this, although I’m not completely closed out to the idea provided there is demonstrably good rationale behind it. But the reasons given here don’t meet that qualification. Please understand that this is not an “I hate it, here’s a bunch of things I just made up to support my position after-the-fact” comment. It’s not the case that I feel that your reasons don’t provide a strong enough incentive to make this change, which is a measure that will vary for each person, and generally, developers win. It’s that, removing those types of personal opinions from consideration—that is, agree or disagree with the desire for this change—the reasoning is not sound; there are contradictions among the points you present. 1. Gives more screen real estate to the add-ons manager. This would allow enough room for useful add-on information, scanning an entire add-ons inventory, and functionality like add-on preferences. Please don’t assume this. If the add-ons manager is in a tab, I no more want it to require my browser be sized to an inefficient width than for Web pages to require the same, and that assumption is already egregiously present from the latter. I will start again with the above quoted paragraph. The notion of wider screen real estate is incongruous with point 3, the considerations for mobile devices, which I will discuss below. 3. Allows for a similar add-ons experience across different devices. Running the add-ons manager in a tab means that an internet-capable device does not need a separate window or menu to modify add-ons – any device which can open a window can use add-ons in the same way as a desktop computer. Add-on management on mobile devices, tablet computers, and fullscreen mode would all provide the same experience. This is a huge win as the web becomes less about the device it runs on and more about the user, who may access the web on multiple devices. Given the incongruity I pointed out above, the likely decision would be to tailor the contents of the Add-ons Manager presented by the mobile version to require less screen space, which eliminates the “same experience” benefit. Additionally, a tabbed Add-ons manager fails to satisfy the “same experience” criterion as related to other desktop applications. 2. Presents a less fragmented browser experience. Firefox’s chrome is basically a frame in which users go about their online life. But to modify that frame, users have to jump outside of it and onto a floating window. Modifying add-ons in the content space means the user never has to leave their tabbed browsing. Also, they can see all changes their add-ons make rather than having those changes obscured by a window. Given a sufficiently large canvas available to tab contents, as presumed and required by point 1, the current Add-ons Manager requires obscuring no more of the browser chrome than a tabbed one. However, a tabbed one does require that its tab be focused, which implies that other Web content tabs are not. This presents a problem if the add-on being managed is making alterations in the canvas of Web content, while there exists no benefit of unobscured browser chrome over the current Add-ons Manager. The net effect is an objective loss. I hope that my comments have stimulated thoughts, and I look forward to a reply. To point out something in David’s comment, specifying a “different background, different font, different favicon (or none at all)” are all things that are exposed to Web content today. Colby: You misunderstood. I was talking about differentiating the appearance of the tab, not the page content. Those things are not exposed to Web content (save for choosing the favicon). If part of the problem this approach is trying to solve is so the addons manager does not get ‘lost’ then this seems like jumping out of the frying pan and into the fire. I keep *many* more tabs open than I do windows. I am much more likely to lose or forget a tab than I am a window. I currently have 4 windows open, but I’d be embarrassed to count how many tabs I have open. I appreciate the window approach, as much like the options/preferences window, I can focus on it, deal with it and be done with it. It is not content that I want to monitor. I don’t keep it open and I don’t want to manage it on a continual basis. What I don’t need is one more tab to add to my mess. I cannot stop the addon installation process once i’ve clicked Install button. The only way is by quitting firefox. Is there any way to cancel an install midway? Could you provide specs on the add-on(size, updatehistory, etc). Yeah i know add on files are small, but i’d still prefer watching their weight. There should definitely be a way to cancel mid-installation, for add-ons and everything else. Add-on specs would also be awesome, if not in this release in the future. Being able to catch when an add-on is getting out of control or hogging memory – even seeing what resources are allocated to what add-ons – I think would be very useful. The other nice thing about rendering controls like the add-ons manager in content is that the window could be detached. On point 1 – Because tabs tear off, the currently present option to detach and resize the add-ons manager would still be available. On point 2 – Yes, different devices would have different sizes, but the main interactions and workflow in the add-ons manager would remain the same. For instance, right now mobile Fennec and desktop Firefox have completely different add-on manager experiences which are displayed in different ways. If these two designs became more closely aligned, users would not have to relearn add-on usage. On point 3 – This is a good point – it’s true that the add-ons manager would take the place of the contents of a page. To see the effects of add-ons on a particular pages, users would need to detach the add-ons manager or open it in a separate, possible chromeless window. Thanks for the great ideas. I do think some chrome modification, such as the ones you proposed, could be a good solution. Re consistency, I think that probably all separate windows could live happily within Firefox’s chrome in the future. If anything, I worry about things moving in slowly, leading to some panels being separate windows and others not. – On bullet 1: as tabs tear off, the add-ons manager would always be separable from a window. – On bullet 2: Absolutely I would want to make this available. I think clicking on any category heading should show a kind of digest view, with a short entry for each add-on in that category. Good point – picking the right categories is a tricky challenge. It’s one I’d love to do some user-testing on. I take it you like what AMO’s done? Yikes! I don’t know what to do with positive comments! Thank you! And yes, I think separate windows being integrated into the content space is the Terrible Future that Firefox should move to. Basically I wanted to say I’m not addressing it now, but yes it will be addressed. Seemed like an easy thing for comments to focus on unnecessarily (for now). Looks realy great! I love this idea. 1. I fear the way this might look in windows larger than 800×600 (the appx. size of the mockup above). Lots and lots of white space. 2. It seems to take excessive effort to find an item in the list. I’ve got 19 extensions, probably more than most Firefox users. Splitting into categories introduces extra clicks to find them, for what gain? A list of 19 is certainly not too much to scroll through. 3. When I want to find an extension, I have to guess which category it was put in? Some are obvious, some are very non-obvious. What about non-AMO-hosted extensions, what category do they go in? And where does the screenshot come from? 4. How extensible is this? Stylish already adds itself to Add-Ons, and Greasemonkey is working on it (I am! see: http://bit.ly/8h3SRe http://bit.ly/5tgmkj) This layout doesn’t seem to work well for either of those uses. At the very least, I’d like to see extensibility taken into account in whatever add-ons revamp might happen. Doing it now is difficult, and (at least my current work-in-progress solution) feels hackish. 1. We’d definitely take different sized screens into consideration. As for me – I’d prefer whitespace to not enough screen real estate for relevant data. 2. I would like to make a category level “digest view,” similar to the add-ons manager now. What this would provide is a quick overview of all the add-ons in that section with a brief description, allowing for more detailed view from this screen. 3. Rather than guess which category, you could use the search box in the upper right of the mockup to locate a particular add-ons. I’d like to implement madhava’s idea of having your own add-ons appear first in the search results, and AMO add-ons listed after that. Non-AMO-hosted extensions would probably predominantly be listed as features. 4. 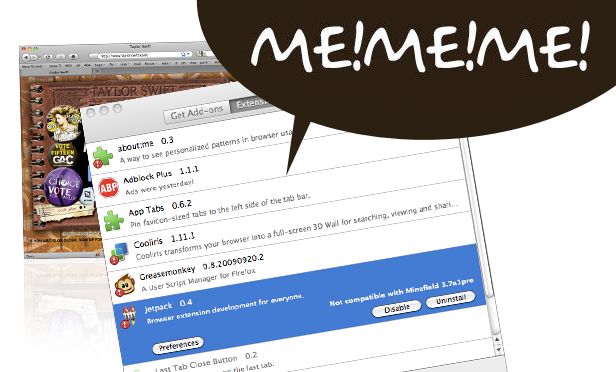 Greasemonkey scripts I’d like to be incorporated with this as all – perhaps even listed under a Greasemonkey category. I could see jetpacks working similarly. I absolutely love this idea, great job! One thing I would like to see however is better discovery functionality. What about showing a list of the most popular, highly rated, or most shared addon like the front-page of AMO? Also, I think a button for sharing on Facebook, Twitter, etc, would be great. Users prefer to install addons from within their browser instead of visiting a web page, so I think it would be great if more features from AMO were added. – Having it as a tab will mean that it is quickly lost for those of us who keep dozens of tabs open at a time when we’re researching topics. – We don’t interact with the Add-On Manager every day, like we do with tabs. If something is a rare occurrence, it’s far that it is treated differently, and that includes its UI. It doesn’t matter if the manager is a separate window if all I’m doing is acknowledging the installation of updates or browsing/downloading new Add-Ons when I’ve just installed Firefox on a new machine. – You won’t be able to see the effects of changing Add-On settings on web pages without detaching the tab from the strip. This is an action which is alien to the majority of Firefox users. As others have said, the mock-up is too complex. The current list is fine, possibly with some additional information when you click on an item. The majority of users only have a handful of Add-Ons installed, if any, so a simple list is the most logical, easiest to digest solution. Please don’t complicate matters. Sorry for the negativity, but this seems to be a change made for the sake of change, and would be a backwards step in terms of usability.